What is it about the morbid and the disturbing that has fascinated so many throughout time? Is it the mystery of the unknown, of what lurks in the shadows? Is it the desire to push ourselves to the brink of what our minds can endure–a cerebral equivalent of physical death-defying sports like BASE jumping or ice climbing? At its heart, I think, it’s the need to imagine that our world extends behind the purely physical and into a realm we don’t quite know or understand. There’s a spiritual optimism to it, a curiosity that is–at its heart–undeniably human. The Morbid Anatomy Museum, which opened last year in Brooklyn’s Gowanus neighborhood, explores this fascination. The ground floor houses a coffee shop and gift shop with items like squirrel tales, unsettling photographs, wax modules of maladies like an ocular horn (do not Google this) and taxidermy everything. The second floor space is devoted to the current exhibition (Do The Spirits Return? 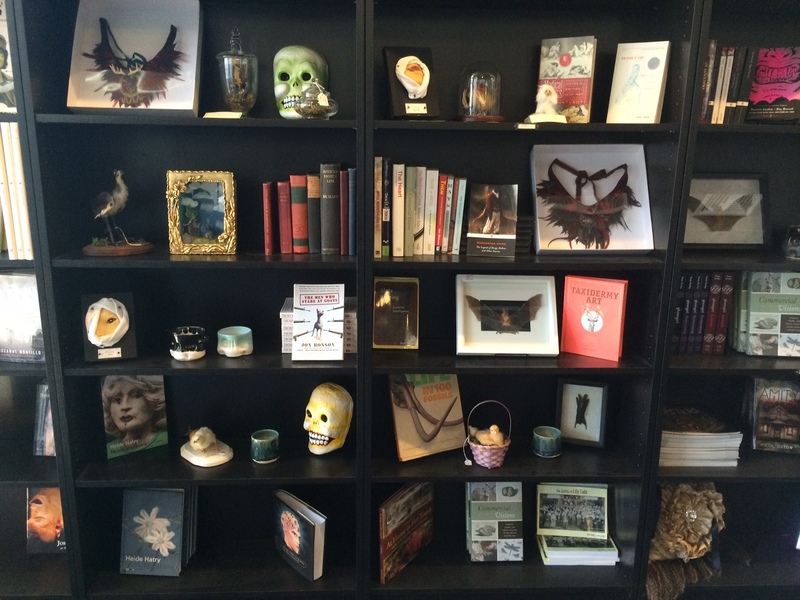 : From Dark Arts to Sleight of Hand in Early 20th Century Magic; April 11, 2015 to January 5, 2016) as well as a research library borne of museum founder Joanna Ebenstein’s own collection of books, photographs, art and objects devoted to anatomy, death, medical anomalies and other curiosities. The museum also offers an intriguing lecture series featuring talks, movie showings, and more by academics and historians discussing such varied topics as “A History of Serial Murder from One Billion, B.C. to the Present” (May 5) and “Psychedelics and Death: A Brief Introduction” (May 21), both already sold out. Taxidermy classes help participants create animal displays like a two-headed mouse or a squirrel shoulder mount.